The incredible six-fight win streak of Francis Ngannou that cemented him as the top contender for the heavyweight belt came to a halt at UFC 220. 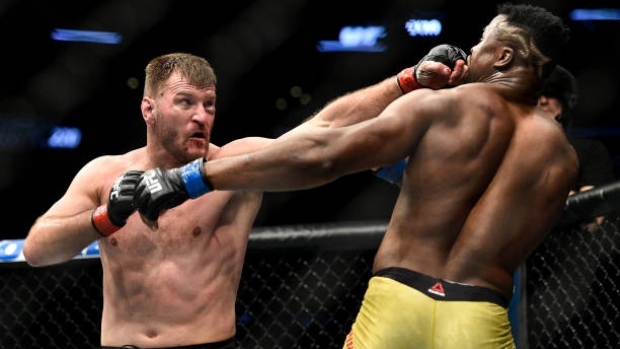 Heavyweight champion Stipe Miocic outworked Ngannou, frustrating and exhausting the Cameroonian en route to a unanimous decision (50-44 on all cards) victory. The win marked Miocic’s third successful title defence, which set a record for the most defences in UFC heavyweight history. After the victory, Miocic announced that he and his wife Ryan were expecting their first child. While the next heavyweight title challenger is unclear, former champion Fabricio Werdum told TSN that he felt that he was next in line and guaranteed that he would be the champion again in 2018. After suffering a loss last July at the hands of Jon Jones at UFC 214, a result that was overturned to a no contest after Jones was flagged for a potential USADA anti-doping violation, Cormier returned to the win column with a second round TKO victory over Volkan Oezdemir. Oezdemir started the fight by stalking Cormier and attacking with an array of strikes, but ultimately Cormier was able to implement his gameplan and overwhelmed the Swiss fighter with his striking and grappling prowess. In the second round, Cormier was able to smother Oezdemir with his top control, which he parlayed into a crucifix position that he used to land strikes on his defenceless opponent. After the win, Cormier told TSN that he is still holding out hope that Jones is reinstated this year so that he can fight him for a third time and get the win that has eluded him. UFC 220 at the TD Garden in Boston drew an attendance of 16,015 for a $2.45 million gate. The UFC awarded performance bonuses to Calvin Kattar and Shane Burgos for their spectacular fight that Kattar ultimately won by TKO and to Cormier and Abdul Razak Alhassan for their finishes over Oezdemir and Sabah Homasi respectively. Following UFC 220, UFC president Dana White told TSN revealed that the injury that forced middleweight champion Robert Whittaker to withdraw from the main event of UFC 221 in his native Australia was a serious staph infection. White said that Whittaker had a staph infection in his stomach that was not treated properly and started to eat away at his organs, leaving him in what White said was “serious condition”. Luke Rockhold and Yoel Romero will headline UFC 221 on February 10 in Perth, Australia with the interim middleweight title on the line while Whittaker heals. Kelvin Gastelum was one of the guest fighters at UFC 220 and he told TSN that he was disappointed that Romero was given a shot at the interim middleweight title rather than him. Gastelum is coming off a first round knockout win in November over former champion Michael Bisping, while Romero lost to Whittaker in his previous fight. Gastelum also said that he currently does not have a fight lined up and that he still has interest in moving back down to the welterweight division depending on how the title pictures in each division shake out in the near future.